Sparring partner Stan Martyniouk doesn’t think World Boxing Organization (WBO) welterweight champion Manny Pacquiao (56-5-2, 38 KOs) will have too many problems in his fight next month against unbeaten Chris Algieri (20-0, 8 KOs) on November 22nd at the Cotai Arena, Venetian Resort, Macao, in Macao S.A.R., China. Martyniouk, one of four sparring partners that Pacquiao will be using to get ready for the 5’10” Algieri, thinks that Algieri will have a tough time with the speed and power of Pacquiao next month. Martyniouk says that he learned a lot from the sparring session with Pacquiao. Algieri isn’t the type of fighter that stands in one place for any length of time so it might be a tougher fight for Pacquiao than Martyniouk thinks it’ll be. If Martyniouk is mimicking Algieri’s fighting style and still having problems with Pacquiao then it’s possible that Algieri could struggle. But Martyniouk is a completely different fighter than Algieri, and it’s doubtful that he’s been able to properly mimic Algieri’s constant movement. Martyniouk doesn’t move a lot in his fights, and he’s not the first person I would think of if I was looking for a guy to get me ready for a fighter as mobile as Algieri. If Martyniouk is having problems with Pacquiao’s speed and power then it suggests that he’s not moving enough and is standing in front of him for too long of a time. “He [Pacquiao] is very tricky, very fast, got great movement and has very good power,” Martyniouk said. 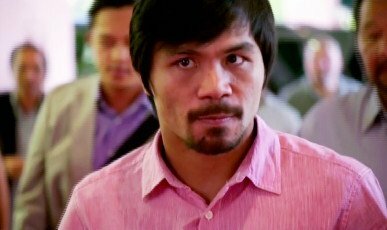 Pacquiao is tricky if you stay in front of him, but if you use your boxing skills as Tim Bradley and Juan Manuel Marquez have used in their fights against him then he’s very beatable.